On Campus This Fall: Filmmakers, Mountain Goats, and Arianna! 8/4/2009Share this story on Facebook! 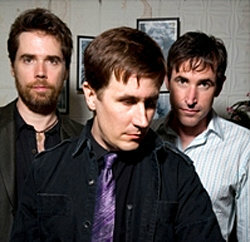 The Mountain Goats will perform at IC on September 18. This fall you don't need to leave campus to see some exciting events and speakers. IC has plenty of distinguished visitors in the lineup, so get out your calendars and plan ahead! Indie filmmakers Tia Lessin and Carl Deal will be on campus September 15 and 16 to talk about the challenges of indie filmmaking and to show excerpts from Columbine and Trouble the Water, their documentary about Hurricane Katrina. The film won the Grand Jury Prize at the 2008 Sundance Film Festival, a Gotham Award for best documentary, and has been nominated for an Academy Award. Next on the agenda is the Mountain Goats, an indie rock band led by one of the most prolific and poignant songwriters in indie rock and folk, John Darnielle. This unusual band formed in the early 90s and took the world by storm with highly literate and metaphorical lyrics, accompanied by music recorded mainly on a department store boombox. The group will be performing in IC's Emerson Suites on September 18. The Park Distinguished Visitor Series and the Park Center for Independent Media will host Arianna Huffington on November 3. Huffington is the co-founder and editor-in-chief of the Huffington Post, a news and blog site that has become one of the most widely read, linked to, and frequently cited media brands on the internet. She is also the co-host of Left, Right, and Center, public radio's political roundtable program. Listen to an episode below, concerning the economic crisis. A nationally syndicated columnist and author of twelve books, Huffington was named to the Time 100 in 2006, Time Magazine's list of the world's most influential people. Stay tuned for updates on more exciting visitors coming to IC this year! The Mountain Goats?! I wasn't aware until I saw this! Where do I get tickets?! Thanks Alyssa!